There are times in life when all seems muddy and unclear. It's really that time of year, isn't it? Time to wisely listen to the animals and hibernate a bit. Its the time of year when I drag out magazines to look at new projects, new fabrics, and to think about people I want to work with and skills I need to learn. I read a lot and cook and try to actively NOT think at times. After a few weeks of this, something generally starts to emerge. I am a list maker, essential for anyone balancing too much in their life, and if I lay the lists out next to each other I generally start to see a pattern of interest. I can see now that there was no way I could sustain the amount of work that I was doing. I think less teaching, or at least more isolated teaching, is in my future. I love teaching, but I end up giving too much of myself and the transition between designing and teaching isn't as fluid for me right now. I think now is a time to concentrate on design ideas and working on selling. I went up to Showcase on Monday, just to have a look around. I was nearly certain that it wasn't for me, but I wanted to get some feedback on designs. Not only did I get excellent feedback on my hats and scarves, but I really do think Showcase will be for me next year. I have a lot to do to get ready, including perfecting my begging face when I have to go to the bank and look for a small business loan, but it will be worth it for the exposure. The addition of the fashion show this year was really the clincher. I was told that my work would have been perfect in the fashion show the night before, that I was on track with the style and textures and colours. And I took a good hard look at what the other knitwear and felt people were doing. There's no point replicating the same designs as we all look the same and it only creates a price war. So I now have a fair idea of what I will make that will stand out from the crowd. Now to just find the space to do it! I am also seeking advice from a mentor and I am toying with the idea of changing my company name and re-branding. It's a bit fussy, but I think the name I have hasn't been connecting at all and now is the time to do it. I have arrived at a name and mentor thinks it's good, too, so just have to think about it over the week and then order new business cards and labels for clothing. Some progress is being made on sorting my house out. I made a space for my dyeing microwave and now just need to find a space for all my dyeing equipment. Not easy!! Hopefully some space will be made available in the near future. Meanwhile, I am working on samples to show a couple of shops who I am going to approach. I need to get all my details all organized so it looks like a cohesive package. The mist is lifting and I can see the blurry picture in the distance! And I also need to get taking some pics because this is all I had this week! I can getting. The new economy line, I think! It's mid-January and we are in the middle of a very mild winter, especially compared to the last two years. My family in Seattle and friends in Boston are despairing the cold and snow and ice, but here in Ireland we are getting a reprieve from the nastiness. I hope to God it means that we might actually have a beautiful summer also, as the rain this year has been fairly unforgiving. I closed my studio this week and it was hard work. Condensing another house into my small house is not easy and I found a place to store my felting tables until I can find another workspace. My house is like a bomb site. I look at the boxes and bags everywhere and I hardly know where to start, but I know I have to make a start of it or I will go nuts. There is space in the spare bedroom to store supplies and possibly sew, but there is only room on the kitchen table to lay out small felting projects. The full dye kitchen is much harder as there is so much STUFF to store and I think it will just have to go out to the shed and hope the weather doesn't ruin it. Mildew seems to be breeding with alacrity and as soon as I get the clutter under control, I need to wash walls with mildew killer and start painting. Using a lot of gray to foil brighter colours. it really makes the vibrant ones pop. About 5 of my framed textile pieces were damaged with mold/mildew while in my studio. It must have happened over Christmas when I didn't have the heat on. I need to take them apart and do repairs so that I can get them up on the wall where they will be safer from children and accidents. They are certainly cheering my house up no end. I am so sad about failing and burned out that I haven't even picked up my crochet hook, but that's probably the thing that I need to do. Floundering is not good, but I am craving quiet and time alone to figure out what I will do with my felt. I need to get Internet sales going on Etsy or somewhere else, but I need to organize the house first so I can look clearly at designs. And I want to focus on design work as the newer designs are selling the best, so I know I am on the right track. In the meantime, I have a part-time job I started selling ads and I am hoping that this will bring in some much-needed income. Typically, it is mostly commission, so I will have to keep the head down and the Skype on to make some progress. It is about time for SOMETHING to succeed as I will also need funds for the next attempt at a studio or flogging my felt. In the meantime, I am heading up to Showcase tomorrow to have a look around and meet a few people. I need feedback on my designs and time to look around and figure out where I am going next. Can't wait to see Pat Lawless' stand as he got a commendation from the Craft Council and the fabulous Garry Marcham will be up there also. If I can't succeed, then at least people I know and like should succeed!! The mentor that I requested has finally arrived after three months wait and we need to put our heads together and see if we are agreed on what to do next. He is suggesting I change my business name and re-brand. I will have to be convinced!!! I have spent the last three days dyeing cloth with over 60 primary school students. I realized over Christmas that if I wanted more students for the Craft Club then I needed to head out to the schools. So, I went to Lispole and Dingle primary schools and I offered to teach colour theory and dyeing to the kids to get them interested in making. They all definitely loved it, but it remains to be seen whether I will gain any students from it. I shall have to wait until Saturday and see what it brings. If it all goes pear-shaped, then I will have the hard decision of closing my studio. People are just not buying and I can't fund it without income coming in. The students are buying me some time to build up clientele and work on new design ideas, but if I can't get the students then I just have to move as much as I can back home. It would be both a blow and a relief. I would only have space to make small items as my house won't accommodate all the materials I have acquired, but the financial pressure has been immense. It would be nice to just go to bed and be able to sleep the whole night through. There has been a lot of talk about using public buildings to provide arts space/studio areas, but nothing seems to be rising to the surface, certainly not in Kerry. With many talented people abandoning their craft right now, the Craft Council of Ireland or the Department of Arts should really do something to help artisans to continue their work. It will come to a stage where emerging artisans will not be able to afford to develop their work because the resources to assist them just aren't there. The state of Ireland is just bad right now. I am usually a glass half full kind of person, but the lack of direction and jobs, unbelievable amount of taxation, and extreme corporate greed has left almost all of us a bit deflated. Even if I wanted to abandon all my training and get another job, where do I go? My cost of living would be much higher somewhere else. Where are jobs better? It's a miracle I can get out of bed every day with all this swirling around my brain. Is it too much to ask that my work sells and I make a modest living? Well, it's January, and as usual I have a couple of goals. Trying to stay in business is one of them. I keep hearing on the news how the retail receipts are up and it was improved on Christmas 2010, but I did far worse. Is it possible that they are lying to keep us all going??? Tralee was deadly quiet until the 4-5 days before Christmas. I think everyone is waiting until the last minute now to get the best deals. Understandable, but hard to take. I heard that people in Dublin at the Gift Show in December returned items that weren't made in Ireland and were almost patriotic about it. That did not happen in rural areas. I did not have much to spend this year, but I did try to buy as much as possible locally and Irish so that at least it was money staying in Ireland. I saw people doing that last year, but this year it fizzled out. It is rather hard to go chirpy into the New Year with financial disaster looming. I know I am not alone, but somehow that is rather poor consolation. I did get a nice shared feature in the Irish Examiner in an article called "The Life Changers" written by Sharon Ni Chonchuir, so many thanks to her for that! The photo turned out great, so much try and get a copy. All publicity is good! Merino bainín and hand-dyed merino. beads. Scarf: 19 micron merino, resist-dyed. Curious response to my samples sent to Boston. When they came back, the buyer was complimentary but said that my hats and scarves were "too upscale" for them and "possibly in another economy they would consider it." 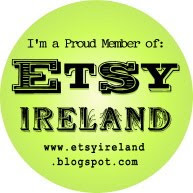 Now this is a person specialising in handmade Irish craft for 40 years or more and they sell in an affluent area. The only thing I could take from that is that Irish Americans want the same design the Failte Ireland has sold them all along: tweed, muted colours, and traditional design. The only problem with that is it isn't modern Ireland. Does anyone have any thoughts on this??? Must get into the studio now as its time to start producing work again. I had a much-needed break, but it's time to start keeping the wolf from the door!